I’m writing this post because this message hit home yesterday. An editor can usually tell within the first page or two if a manuscript is good or acceptable. A novel’s first pages encapsulate much of the story and establish character, setting (time and place), voice, pace, and even audience. I started my novel a while back and wrote it piece by piece–a piece here, a piece there, knowing the pieces would need to be shuffled around and reworked. I started in a mysterious tone. I really liked it. But, alas, it didn’t work. Actually, I broke all the rules. So I spent yesterday killing words. There were words and paragraphs and chapters that I loved. The wording was precise and exact and descriptive and I thought, um, beautiful. But I killed them. I can easily kill the words of other people when I edit, but it was really hard to kill my own. I’ve done this before to my own work, but never, ever this much. After killing words, I like the new chapter. I think I’ve created a platform, a story opening, that I can jump into the depths from and swim across the pages. Do you open in scene? Some manuscripts open with interior thoughts of the characters or with description of the place. Ask yourself: is anything happening? Do you give too little information? Some manuscripts attempt to create a sense of mystery, but in doing so, don’t give the reader enough information. Some manuscripts don’t make clear what is happening or the importance of what is happening. Ask yourself: do you make clear where the characters are and what is going on? Do you give too much information? Some manuscripts start with pages of backstory or description or flashbacks. As an editor, I’ve killed five to fifteen opening pages of different manuscripts. (It’s easy when it’s not my own!) A reader only needs enough information to understand the scene in progress. Good and successful manuscripts are well-balanced with action, motivation, a little description, and some thought. They begin with a main character in a scene with an immediate goal to achieve. They pull the reader in to turn the page and see what happens next. 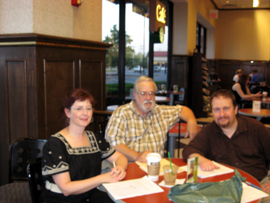 TurnStyle helps with the editing of full manuscripts, but also with first chapters. Let us know if you need to make sure you are on good footing in your opening! I’ll tell you one thing for sure — Darnell Arnoult can lead a good workshop! 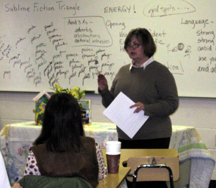 The Council for the Written Word had its sixth annual spring fiction workshop this morning. 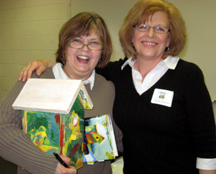 Darnell led our first spring workshop in 2003, and in the intervening five years, she has published a book of poetry and a great American Southern novel, Sufficient Grace, and among other honors and achievements, she was the 2007 Tennessee Writers Alliance’s Writer of the Year. Darnell not only puts energy in her own writing, but she fills her presentation with it. 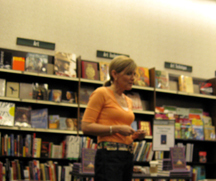 And speaking of energy … a novel, she says, should open with a confident voice, a specific event, and an early hook — something that will make the reader want to move forward. If you have an impulse for a novel, Darnell continues, it will only get you fifty pages. After that, the impulse loses its gas, and at that point, novel writing is hard because you have to start pulling things out of the air. So from experience and observation, you pull in specifics with which you can bring in colorful and memorable details (and you get these from looking through the little notebook you are supposed to keep in your purse or pocket to record all the interesting and unusual details that happen during your days). Once you’ve written a scene, you go through the manuscript with a red pen and circle every meaningful specific, every image you can see vividly in your mind. Then you hold the page out and squint at it. When you see big holes with no red, look for a meaningful specific to add. I’m thinking that should go in the little notebook in my purse. 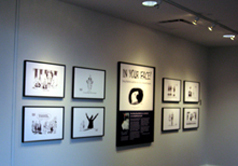 Gray walls in the hallways of the Overby Center at Ole Miss display framed black-and-whites of Doug Marlette‘s cartoons. Friday’s workshop prior to the Mid-South Creative Nonfiction Conference was held here and so were the agent/editor One-on-Ones, so I had some time to browse. Marlette’s editorial cartoon The Challenger — in the center above — is probably the most widely known. On the day of the shuttle accident, he captured the look we all felt — shock, sadness, a grave sense of loss. He won every major award for his editorial cartoons, including the Pulitzer. But Marlette was also a novelist. His first book The Bridge was published in 2001 and named Best Fiction Book of the Year by SEBA in 2002. His second novel, Magic Time, was published in 2006, less than a year before his untimely death. Magic Time moves between two periods of time: New York City and small-town Mississippi during the early 1990’s and flashbacks to Mississippi’s Freedom Summer of 1964 — a church bombing that took the life of NYC newspaper columnist Carter Ransom’s first love and the deaths of three civil rights workers. Marlette gives an honest account of what it was like back then. Marlette spent his growing up years in Mississippi and graduated from Laurel High School in 1967. His father helped search for the three civil rights workers, and Marlette didn’t even know that until after he had written Magic Time. Months prior to the book’s release, I got an email from the publisher, asking if I’d excerpt Magic Time on the online journal I publish — Muscadine Lines: A Southern Journal. I was thrilled at the opportunity. They mailed an unedited copy of the author’s typed manuscript, and I selected a portion of Chapter 5 to feature. I met Doug Marlette at the 2006 Southern Festival of Books in Memphis and he signed my Magic Time: “Mississippi girl, you’ll know these folks.” Yes, Doug, I do. Shock. Sadness. A grave sense of loss. I couldn’t fit the word “killed” in the same sentence as his name. I cried. I didn’t want to drive to Mississippi. I didn’t want to go home. I refused to drive there in the rain. He was too young. He was my age. I felt connected to him through his book about civil rights and race in Mississippi during that long, hot summer of ’64. It was our coming-of-age period in a sensational time and place unmatched in American history. Marlette had a history of openness and honesty on national and world issues in his cartoons, and his written words on the page will go long into the future without him because they speak of raw reality — he tells it as it was. In that way, Doug Marlette will always be with us. I just love it when things turn out so dandy! 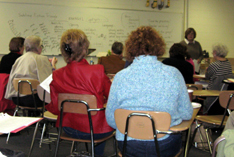 The Council for the Written Word‘s sixth annual Spring Fiction Workshop is March 29, eleven weeks from today, and we are good to go. Everything is perfectly in line. We even have 24 people signed up so far. Darnell Arnoult is the featured speaker this year. 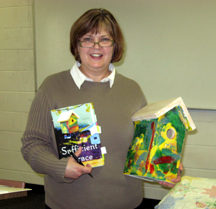 “The Fiction Crossroads: Where Imagination and Craft Intersect” is the title of her presentation. Darnell’s novel is Sufficient Grace, and her book of poetry is What Travels With Us. “Get some of those pastel malted milk candy Easter eggs to go with the birdhouses,” Colleen suggested. And thus we slid into that genuinely creative spirit that makes all our workshops so much fun to plan and to attend. 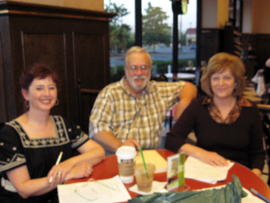 Darnell led our first CWW spring workshop in 2003, held in the old public library at Five Points in Franklin, as they were boxing up and getting ready to move into the brand new Williamson County Public Library. Since then, Darnell has published her novel, which got a starred review in Publisher’s Weekly, a nomination for 2007 SIBA Fiction Book of the Year, and a nomination for 2006 Weatherford Prize in Appalachian Literature. 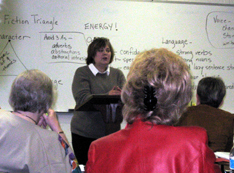 Darnell was selected as the Tennessee Writers Alliance’s 2007 Writer of the Year. I saw her at the Southern Kentucky Bookfest last spring, where she was having a ball signing her books, and again at the Southern Festival of Books last October, where she was just oozing smiles and happiness. It should be a wonderful workshop! How do you take an impulse for a novel and give it momentum? How do you improve on an early draft? How do you infuse your work with energy? Darnell plans to tell us how, and goodness knows, her novel is chocked full of energy, with memorable details and memorable characters! She also plans to share how to get our manuscripts in the right hands. At least two in my writing group plan to have novels finished by the workshop date. If I get my Great American Southern Novel in gear, I might be the third! Hurry March, and bring it on!